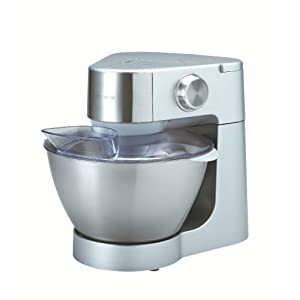 The Kenwood Prospero Compact KM265 is one of the crème de la crème of food mixers and this compact machine is obviously no different from its larger brothers. Like us we are sure your parents would have once owned the larger machine, when mum used to get the old machine out I used to think we was in for a real treat! This new model has hundreds of people raving about how pleased they are with this compact machine. The mixer is compact enough to sit on any work surface however the blender and processor take up a bit of space in a cupboard. The other attachments fit in a drawer apart from the balloon whisk which again needs to be stored in a cupboard. The Kenwood Prospero Compact is robust and is built to last with a simple attachment locking mechanism which gives a definite click when the blender/processor are locked in place. The supplied food processor and blender are easy to use and efficient. It is also simple to clean as all the parts are dishwasher safe. The machine comes with an easy to understand instruction booklet and DVD giving simple recipes ideas on how to use the liquidiser, for making soup. Like its larger brothers the Kenwood Prospero Compact has the following attachments included in the box: Liquidiser, Mill, Food processor, Rasping disc, Fine slicing and shredding disc. Of course there are accessories you can also purchase including the meat grinder/mincer & juicer. Kenwood food mixers have proved themselves to be very reliable over the years and we have no reason to believe anything different from the Prospero Compact. All in all the Kenwood Prospero Compact is competitively priced and offers value for money from a name you can depend on.